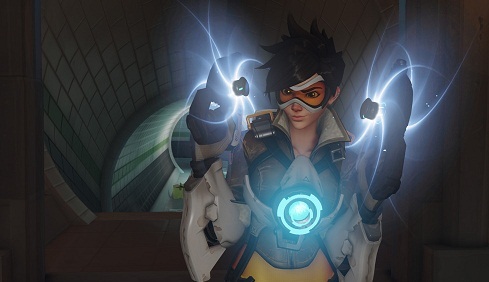 Overwatch is the latest action-packed multiplayer shooter from Blizzard. Seek out one of 21 heroes, each of which has different skills and weapons and fight in 6 teams against each other. You need a good tactic to fight against the other team and achieve your goals. In this beginner’s guide we give you some useful tips for getting started. In Overwatch, there are 21 heroes to choose from. Therefore, try to find your perfect character that suits your style of play. Each hero can be represented several times in the game. The course has the advantage that you can fight with your favorite character, even if a player has already chosen him. A disadvantage, however, that your team should be as balanced as possible. - Offensive: This class does some good damage and destroys the enemy rapidly, by running ahead. - Defensive: You hold the enemy and strengthen your team. This class is in control and the battlefield at a glance. - Tank: This class can do considerable damage. You run ahead and get a narrow path, where many enemies may be lurking. - Support: As one of the most important class as they heal not only their team members, but also increase certain values such as damage dealt or the speed. In Overwatch, most important is the skills of your characters. This unique power or special equipment are meant. You have a primary weapon, which you can operate with the PC with the left mouse button on the PlayStation 4 with R2 and the Xbox One with RT. In addition, you must not constantly look for ammunition. Remember that some abilities have cooldowns; this means that they cannot be used permanently, but rather after some time - charging. You will have to recharge, you can be bridged with a melee attack. You can carryout this attack on the PC with the Y button on the PlayStation 4 and Xbox One with the right analog stick. In addition to these attacks and abilities, there are so-called ultimate skills. You can perform this attack on the PC with Q, on the PlayStation 4 with triangle and on the Xbox One with Y. These skills can decide a match and are very strong. The ultimate attacks have a cooldown. Upload faster when caused you damage. - Provide necessary supplies to balance your team. You need a tank that can usually cause four times the damage as well as one or two supporters. The remaining slots should equip with defensive and offensive characters. - Stay in your formation. So supporters should act further back, while the tank in the front row fights. Nevertheless, it does not help if the damage dealer precedes and is no longer in the vicinity of the supporter to be healed quickly. - Get to know the maps and surprise the enemy. Attack them from a different angle, so that the enemies barely have time to use their ultimate capabilities. - Pay attention to the perfect timing of your ultimate ability. At the beginning of the round it is still loading and once the bar is full, you will be indicated immediately. But set now not instantly but sensibly, when and where they would be better placed. - In Overwatch, you can hardly win if you thoughtlessly run to the enemy and kill him. Stop him rather at a distance and put obstacles in his way. Don’t let him get to the destination by blocking his routes. - Since you get no HUD and therefore also display no minimap, you should pay attention to your ambient noise. So you hear where your enemy is located. - Change your character, if it is necessary. You can fight well with a hero, but it still lacks a supporter in the team, you should change your fighter. - Abstain basically long run lengths. Particularly large spaces are a great danger, because there are many heroes; dominate the ranged attacks that will do you quickly in the long run. Play initially against the AI, to search the map and to make all seats find at which sniper could hide. -. In Overwatch, you have an endless supply of ammunition. Use them and shoot straight on. They do a lot of damage and also load faster. - If you want to level up, you should stay in the match as long as possible. You gain XP for every second that you spend alive in combat. So go no risk if you want to level up quickly and remain calm and don’t break immediately if you don’t see the desired results in the beginning.